While I’ve been in Ottawa I’ve had the chance to try two gold-plated Lefreque sound bridges. Owned by my former teacher, Jo Ann, they connect the bocal to the wing joint and the long joint to the bell. 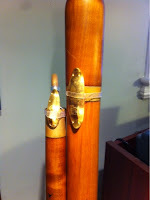 There have been a few bassoonists blogging about the lefreque and so I will leave you to read about the concept of the plates through one of the links above. My story has a funny twist to it – I tested them on my Eichentopf instrument by Peter de Koningh. Though I didn’t have the full variety of plates available to me (there are some made from red brass, as well as sterling silver) it was clear that more experimentation could be worthwhile. After 90 minutes of testing on various reeds and in different places, I did notice a change at the extremes of my instrument. The low C and D ‘locked’ in tune at A=415, the low G and F gained a slight depth to the sound, and the high A and B were slightly more stable. With the two plates on I could slur from high A to high B with less difficulty than without them. The experiment is not over. Though I was impressed, I noticed a much more significant difference on my Heckel, and from Jo Ann’s description of their effect on her bassoon there may be a much better combination for my Eichentopf. “But wait a second, Andrew, is this historical?” Technically speaking, no. These days, however, I am performing my own compositions for the Eichentopf bassoon often enough to warrant the search for any small improvement to ease playability. My compositions test every dimension of the instrument – from dynamics, to technique, range, and articulation – and any help to better facilitate a performance would appreciated. So if you have the chance to try the Lefreque plates, no matter what century your instrument is from, I would recommend taking it. You never know what you might discover.